Diagnosis & other animals (A SciArt blog). planetary shapes and shadow hosts. the drug and the psychology - a part of me? My SciArt? 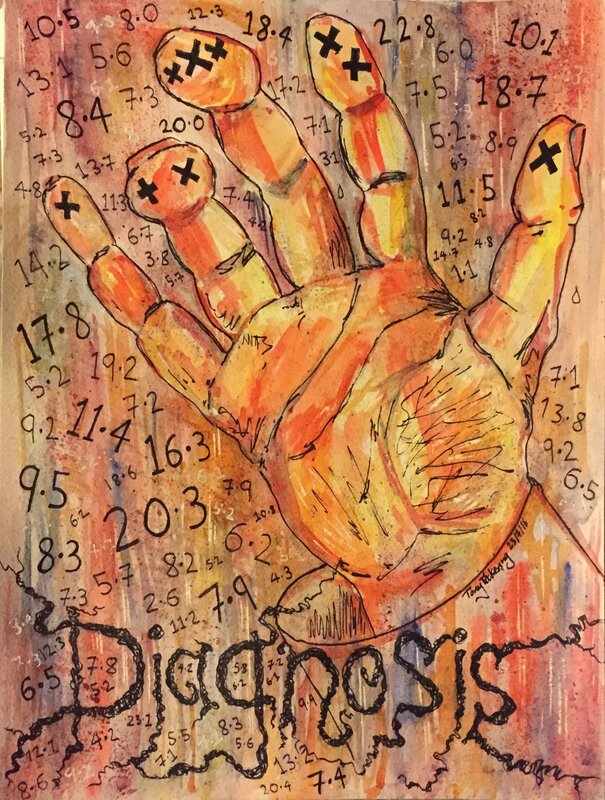 Four paintings I call "Diagnosis". These paintings came from shock. Are they finished - and are they SciArt? I’m not sure, but here’s a little about where they came from. They are paintings I produced in response to the experience of being diagnosed with type 1 diabetes - attempting to express the cognitive breath of the announcement, and the biological and bodily impact in terms of ritual and process. So, type 1 occurs when the immune system attacks the insulin-producing beta cells in the pancreas. This means the carbs in food don’t get broken down, and rather just shoot straight through - which was one of the symptoms that the Doctor picked up on. The other was thirst. All the time - for sugary drinks especially, which would then go straight through again. It’s unusual to be diagnosed with type 1 at my age (41 *sigh). For me the paintings attempt to articulate the mental prodding, poking and gymnastics of the situation. There’s a fair amount of self-reproach, at least until you better understand what has happened. When diagnosed you get a fair amount of kit - injection pens, needle nibs, blood testers, test strips and lancets, plus diaries, diet books and generally a lot of information. But fundamentally your relationship with your body breaks down. My blood can be up or down - both of which are bad and need to be controlled - with either insulin or sugar - meaning I feel a little like Alice in Wonderland eating and drinking till she's exactly the right size. You begin to distrust your own sensations - and you wonder whether you feel what you think, or think what you feel… stuff which I think may be a part of where I go in this option. I had some great feedback from my group about the potential to use the idea of the fourth piece (the glasses - when your body readjusts its blood sugar vision can alter temporarily - but significantly), and to immerse the viewer in the experience using some kind of 3D/ beer goggles/stereoscopy technique to observe the other paintings - or a wider exhibition/installation. Feedback that made me wonder about how far SciArt/ArtSci needs or is interested in interaction with the viewer/audience? My notes show my doodles and research looking at the biology of diabetes - looking at the shape and patterning of the pancreas and the pro-insulin cell. For some reason exploring this physicality (which I’ve never bothered with in the past) made me begin to think of ideas for installations and interactive pieces: blood dripping onto sugar (or vice-versa - using syrup); completing a circuit to light up a pancreas using a injection pen within a florescent light structure; and generally finding ways to whizz-up food - looking at breaking it down which used to be done in the body. Here, if not budget exploding logistical and ethical nightmare installations, are a least the germs of metaphors that could serve illustration well.